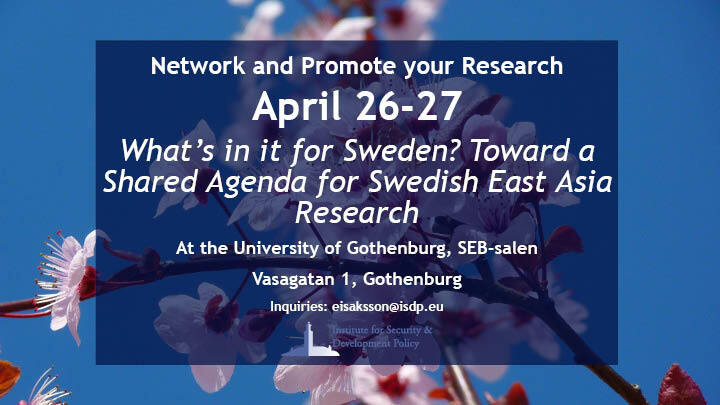 Conference on East Asia Research: What's in it for Sweden? Building on the success of last year’s conference in May at the Stockholm School of Economics on East Asia Research in Sweden, the Institute for Security and Development Policy (ISDP), in cooperation with the University of Gothenburg will organize the conference’s 2018 installment on April 26-27. The title of this year’s conference is What’s in it for Sweden? Toward a Shared Agenda for Swedish East Asia Research. The theme of the conference will center around what our different disciplines, fields, industries and perspectives can and should achieve together. The conference takes place over two days on the University’s premises in Gothenburg. The first day will dig right into the theme of the conference though panel discussions, while the second day will allow you to present your research in a condensed form. An agenda for the two days follows below. 10:00: Introductory words by Niklas Swanström, Executive Director of ISDP. 10:20: Panel 1 – What unites us? What divides us? How do different academic disciplines and industries conduct and make use of research on East Asia? What differentiates Asian Studies from the disciplines and with what implications for society? Are these differences constructed rather than natural and how does this effect those benefiting from East Asia research and Sweden at large? 13:20: Panel 2 – Competing or Cooperating for Resources? What route should be taken by researchers, institutes and universities when applying for funding? How would the researchers and how would Sweden benefit from more or less cooperation? Can we actually cooperate more or would it be counterproductive? Is greater regional centralization of research environments the way forward? 15:10-16:40: Panel 3 – Toward a Shared Agenda? Building on the previous panels: what does a “shared agenda” entail? Should there be a greater effort by researchers, institutes, funders, and industries to reach out to each other? Is there a “prestige problem” among individual researchers and organizations? Are we actually better or worse off with a “shared agenda”? Like last year, the conference is free of charge. Attendance includes lunch both days as well as a Conference Dinner on April 26. The conference receives financial support from the Swedish Foundation for Humanities and Social Sciences. Keep up to date with the latest events with our newsletter.